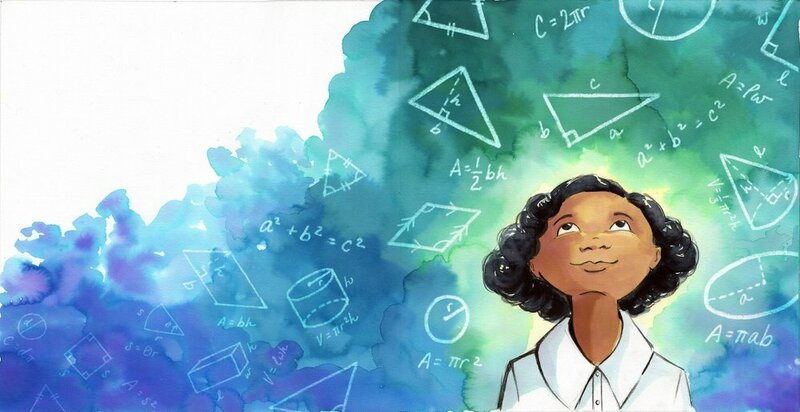 This morning I heard an interview by Scott Simon, host of NPR’s Weekend Edition, with Veronica Miller Jamison, illustrator of a new children's book called Counting on Katherine. It’s about mathematician Katherine Johnson, whose story is featured in the film Hidden Figures. Johnson’s job was to figure out equations for NASA. She plotted the trajectories of pioneering space missions.. She helped bring astronaut safely back to earth after his shot to the moon. Johnson’s story also shows the ways in which she had to overcome prejudice and marginalization to make her contribution to NASA and the world. Scott Simon asks Jamison, the illustrator, how she approached the book’s illustrations. She says she imagined the young Katherine and how the future mathematician may have looked at the stars and seen equations. The interview also reveals the way the Jamison experienced her own childhood through her imagination. Hearing Jamison offers one of the best descriptions I’ve heard of the first step in my coaching process, the section I call “Your Easy Clues.” In our coaching sessions, we spend time collecting the clues to your own childhood loves, the easy clues to your own true story. We take time to appreciate the details of what you loved, what you lost, and what you need now to reclaim on your way to your truest identity. To get you started, we ask you: How did you see the world when you were young? Give yourself the gift of recalling these precious details of your early pulls, and the unique way you saw the world. It just might lead you back to your next step, and the path you’re meant to follow.